The United States Patent and Trademark Office on Tuesday granted Apple's application for a patent describing head-mounted display technology that is tangentially related to see-through, or augmented reality, units like Google's Project Glass. While U.S. Patent No. 8,212,859 for "Peripheral treatment for head-mounted displays" does not directly describe a device like the head-mounted display (HMD) augmented reality glasses currently under development by Google, the filing mentions that the technology can be used in similar see-through solutions. The '859 patent, which was first applied for in 2006, presents various solutions regarding peripheral light transmission in an attempt to address the usability issues associated with HMDs, which have yet to take root in the consumer market. Apple's patent tries to solve problems related to eye strain caused by the display's relative distance from the eye with "peripheral treatment" of a user's field of view. In the technology the colors of the primary source image are dynamically matched by either LED, OLED or lasers and converged stereoscopically to reduce the "tunnel effect" seen in normal HMDs. Besides the peripheral treatment, and more substantial to HMD implementation, are the source and secondary image solutions that can be used in a variety of devices such as augmented reality glasses. 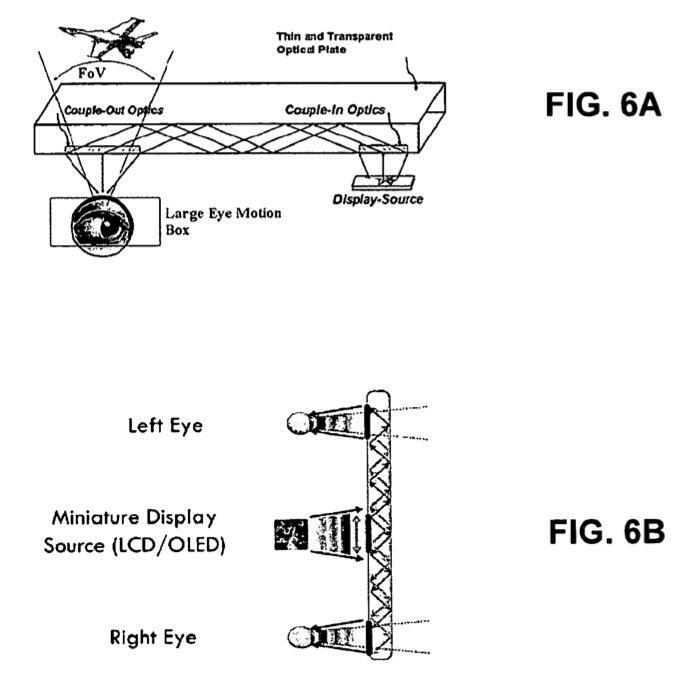 The patent background cites AR directly, saying that "some HMDs can be used to view a see-through image imposed upon a real world view, thereby creating what is typically referred to as an augmented reality." It is noted in that the peripheral treatment can be used in so-called diffractive optical arrangements like light-guided optical elements (LOE) or binocular light-guided optical elements (BLOE), both of which use thin transparent substrates to display source images. A similar method is being used in Google X lab's Project Glass, an internet-connected headset that displays information through digital images and video on a small transparent display in front of a user's right eye. At the Google I/O conference it was revealed that developer copies of the AR hardware will ship in 2013 with an expected consumer release to follow in 2014. It is unlikely that Apple will be using the peripheral treatment patent anytime soon it at all but the filing serves as an interesting behind-the-scenes glimpse at the Cupertino-based company's research and development efforts. The '859 patent is credited to John Tang and former senior vice president of Apple's iPod division Tony Fadell, known by insiders as the "grandfather of the iPod." Apple currently sells the Nest Learning Thermostat, the first product to come out of the new company Fadell founded after leaving the iPad maker, through its online store after having reportedly removed the device from brick-and-mortar locations.